Daniel Clive Wheldon (22 June 1978 – 16 October 2011) was a British motor racing driver. He was the 2005 Indy Racing League IndyCar Series champion. He was also the winner of the Indianapolis 500 in 2005 and 2011. He was killed at the age of 33, in a 15-car crash at the IZOD IndyCar World Championship. Wheldon was born in Emberton, near Olney, Buckinghamshire, England. He started go-kart racing at the age of four. At the beginning of his career in open wheel racing, he had a rivalry with Jenson Button before he left the United Kingdom to start racing in the United States. He moved to the U.S. because he thought the chance for success there were greater than in the UK. He moved to the United States in 1999. He spent many years racing in lower open-wheeled circuits like the U.S. F2000 Championship Series, the Toyota Atlantic series and the Indy Lights series before moving to a higher series. In 2002, Wheldon moved up to the IRL IndyCar Series for two races. He drove for Panther Racing with his teammate Sam Hornish Jr. In 2003, he joined Andretti Green Racing, winning the Rookie of the Year award. In 2004, he won his first IRL race at Twin Ring Motegi in Japan. He finished the 2004 season second in points with three wins. In 2005, Wheldon won the Indianapolis 500. He finished the season first in points winning the IndyCar Series championship. He won six races during the season, breaking the record for most victories in one season. In November 2005, it was made known that Wheldon would be driving for Chip Ganassi Racing in the IndyCar Series in 2006. He went on to drive for Chip Ganassi Racing in the 24 Hours of Daytona, winning the race with Ganassi teammates Scott Dixon and Ganassi NASCAR driver Casey Mears. Wheldon began the 2006 IndyCar season by winning the race at Homestead–Miami Speedway. This was a sombre race, as Paul Dana had died earlier while practising for the race. At the end of the 2006 IndyCar season, he and Sam Hornish Jr. were tied for the lead in the points. They both had 475 points. Hornish had four wins for the 2006 season, and Wheldon only had two. Because Hornish had more wins than Wheldon, he was made the 2006 Indy Car Champion. The BMW Sauber Formula One team gave Wheldon the chance to drive for them, but he turned down their offer. They could not give him a ride for the whole season, so he decided to continue to focus on Indy. Practising for the 2007 Indianapolis 500. On 22 June 2008, Wheldon won his 15th IndyCar Series race in the Iowa Corn Indy 250. He donated all of the money he won to help the victims of the tornadoes and flooding which had just happened in Iowa. 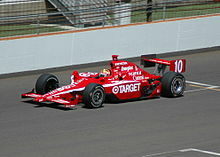 On 2 September 2008, Wheldon left Chip Ganassi Racing. He was replaced by Dario Franchitti. He had chosen to return to Panther Racing. He finished second in the 2009 Indianapolis 500. However, Wheldon did not finish in the top 10 in seven of the last eight races of the year. The next year, he ran well again at Indianapolis Motor Speedway, finishing second. He finished the 2009 season 9th in the series points. He ran well with Panther racing in 2009 but he did not win a race during his time with the team. Panther Racing decided to replace Wheldon with J. R. Hildebrand. He raced in the 2011 Indianapolis 500 with Bryan Herta Autosport, winning the race after J. R. Hildebrand crashed going into the final turn. He was very emotional after winning the race. He did not have a ride for the rest of the season. He was also worried about his mother who had been diagnosed with Alzheimer's disease. He dedicated his win to his mother. It was his first series win in three seasons. On 16 October 2011, Wheldon was part of a 15-car wreck on lap 11 of the IZOD IndyCar World Championship at Las Vegas Motor Speedway. His car went into the air and hit the catch fence. He was taken by helicopter to the hospital. When he was taken to the hospital, he was declared dead from blunt force trauma to the head. He was 33. He is buried at the Calvary Catholic Cemetery in Clearwater, Florida. Wheldon was a guest star in the voice cast for the TV series Hot Wheels Battle Force 5. Wheldon married his long-time personal assistant, Susie Behm, in 2008. The couple had two sons, Sebastian (born 1 February 2009) and Oliver (born 19 March 2011). His family lives in St. Petersburg, Florida. a Wheldon lost the title on the tiebreaker. Wheldon won only two races while Sam Hornish Jr. won four, giving him the championship. 3 Event cancelled after a 15-car incident on Lap 11 involving Wheldon, who later died from his injuries. ** Podium (non-win) means 2nd or 3rd place finishes. *** Top 10s (non-podium) means 4th through 10th place finishes. ↑ 1.0 1.1 "Briton Dan Wheldon dies in IndyCar race in Las Vegas". BBC Sports. BBC. 18 October 2011. Retrieved 24 March 2019. ↑ 2.0 2.1 "Dan Wheldon dies in huge crash at IndyCar finale". USA Today. Retrieved 20 November 2011. ↑ Viner, Brian (25 May 2007). "Dan Wheldon: 'Winning at Monaco would be great, but it's nothing next to the Indy 500'". The Independent. Archived from the original on 25 May 2008. Retrieved 24 March 2019. ↑ "Dan Wheldon: a career in pictures". The Guardian. 18 October 2011. Retrieved 24 March 2019. ↑ Salisbury, Matt (30 January 2006). "Grand-Am: Ganassi secure maiden Rolex 24 win". Crash. Archived from the original on 18 December 2018. Retrieved 24 March 2019. ↑ Biebrich, Richard (27 March 2006). "A Driver's Duel". Sun-Sentinel. Archived from the original on 18 December 2018. Retrieved 24 March 2019. ↑ "Dan's race, Sam's title". Eurosport. 10 September 2006. Archived from the original on 18 December 2018. Retrieved 24 March 2019. ↑ Himmer, Alastair (18 April 2006). "Wheldon turned down BMW F1 offer". Autosport. Retrieved 24 March 2019. ↑ Simmons, Marcus (17 October 2011). "Dan Wheldon: 1978 - 2011". Autosport. Retrieved 24 March 2019. ↑ Perez, A.J. (3 September 2008). "Goodbye NASCAR: Franchitti headed back to IndyCar Series". USA Today. Retrieved 2 September 2008. ↑ Lewandowski, Dave (9 February 2011). "Wheldon, super hero of Battle Force 5". IndyCar Series. Archived from the original on 19 October 2011. Retrieved 17 October 2011. ↑ "2009 IZOD IndyCar Series Point Standings". Retrieved 2011-11-19. ↑ "Britain's Dan Wheldon wins second Indy500 after rival's late crash". The Guardian. 30 May 2011. Retrieved 31 May 2011. ↑ "Indy 500 winner Dan Wheldon enjoys moment in spotlight". USA Today. 30 May 2011. Retrieved 31 May 2011. ↑ "Dan Wheldon gets stunning Indy win". ESPN. 30 May 2011. Retrieved 31 May 2011. ↑ Lewandowski, Dave (9 February 2011). "Wheldon, super hero of Battle Force 5". IndyCar Series. Archived from the original on 19 October 2011. Retrieved 24 March 2019. ↑ DeGregory, Lane (17 March 2017). "Susie Wheldon, wife of late IndyCar champion Dan Wheldon, opens up about life without him". Tampa Bay Times. Retrieved 24 March 2019. This page was last changed on 24 March 2019, at 16:23.